Town President Larry Dominick joined officials of METRA and the Cicero Town Board on Wednesday morning to cut the ribbon on $4.5 million in improvements completed this week on the Metra Train station at 49th Avenue and 25th Street. Planning for the improvements began in 2005 with funding approved in 2009. The groundbreaking took place in August 2012. Improvements include rebuilding Cicero’s platforms and shelters, which were in badly needed repair. The 18-month-long renovation project is part of a $136-million, state-funded public works program that includes three new Metra stations and rehabbing 25 dilapidated facilities. Metra has more than 230 stations serving about 315,000 daily riders. 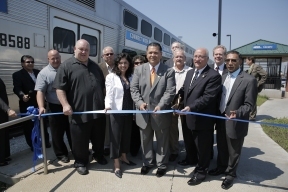 Cicero and Metra officials cut the ribbon at the access ramp of the renovated Metra station at 25th and 49th Avenue, a half block west of Cicero Avenue. From left (front): Cicero Assessor Emo Cundari, Town President Larry Dominick, State Rep. Lisa Hernandez, State Senator Martin Sandoval, Meatra Executive Director Don Orseno, and trustee Victor Garcia. Backrow: Trustee Larry Banks, Clerk Maria Punzo-Arias, Trustee Dennis Raleigh. Photo courtesy the Town of Cicero.